Chip Damage, Games on Campus, and Winnipeg Smash Bros is proud to present Manitoba’s largest annual fighting game tournament! This is the one you’ve all been waiting for: all the games you love jammed into an action packed two day event at the University of Manitoba. Make sure to get ready and go all out because Manitoba and Saskatchewan’s strongest players will be there too. Due to the enormous interest in Smash Bros we’ll be collaborating with Winnipeg Smash Bros run the Smash Bros. side of things with Project M, SSBM, and Melee team tournaments. Our tournaments will be running concurrently with the Smash Bros tournaments to ensure a more enjoyable tournament experience for all. There will be lots of setups for friendlies and money matches throughout the weekend! This is a Bring Your Own Console event. Please feel free to bring your own setups, stations, or controllers. All ages welcome. 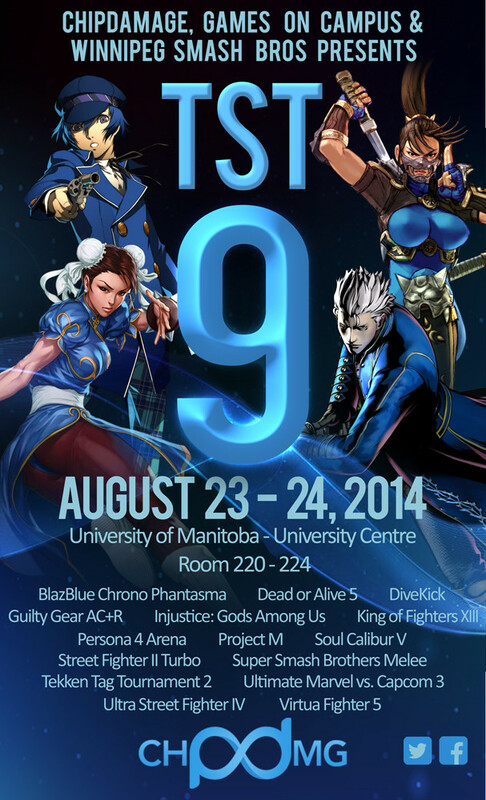 Join us at the University of Manitoba, University Centre August 23rd and 24th for That Summer Tournament 9! Please fill out the pre-registration form as it greatly helps us to make brackets and adjust our schedule as needed. pre-registration will close on August 20, 2014 at 11:59:59 pm. Saturday and Sunday, August 23 and 24, 2014. Tournaments start at 1:30pm sharp. Doors open at 12 noon. $5 Registration. $10 Entry fee for each tournament. Spectating and casual play are free entry. Otherwise, feel free to email any questions or comments to mail@chipdamage.com. Cash prizes with nothing taken from the pot entries. The pot is split among top 3 with a 70/20/10 ratio. Rules are standard for every game. Double elimination tournament brackets with best two out of three matches. Grand finals and Winners/Losers finals are three out of five. UMvC3 has the only exception of being 3/5 sets throughout the entire bracket. We follow the standard EVO rule set. This includes banned wireless controllers. This is a BRING YOUR OWN STICKS/CONTROLLER event. All games will be played on US Playstation 3 consoles. The console equipment will be labeled and registered to ensure its safety. However, please be careful with your sticks. Furthermore, if you know you’re attending and you do not have a stick to use, make sure you have a friend who can donate. For pad/PS2 stick players, we tend to have PS2 pads and/or converters around, but don’t take this as confirmation of us having them there for you. Bring your own to be safe as opposed to being disqualified for not having a controller available at time to play. We cannot hold up the tournament for your convenience. See our full event rules here.